Another vespa! Ohh I love her look, a typical italian woman: elegant and classy! Art or fashion, i'm not sure what is is. But I love the picture and her carisma. I think I'm in love with Scooter-Girl. That shade of blue and camel go so beautifully together. Heels & a mowped. Doesn't get much better than this. I love the idea of matching your clothes to your Vespa. I have a red one and this has me thinking. Also, I always respect a well-loved well-used scooter. This is very creative. Inspire me to modify my vespa ASAP! apparently the most popular accessory in milan is a vespa. to me this photo is all about her attitude. Christopher Kane dress!! Brum Brum! What a great photo. Fashion + Art. 'Those feathers in her hair. It's witchcraft.' She might have substituted the feathers with a beautiful headwrap but it is still mesmerizing. Frank might still be right. Actually, she looks much more french than italian… In many ways, italian women – with a small exception for a few from Milan and from the deep south – are not as elegant as the majority of people all around the world probably think. Italy has lost freshness, our imaginations has got poorer and so the shops windows, that merely advertise the brands. I live in Rome, but I do often travel to France, and the comparison brings me to say that we've no more idea of what elegance is (the best things I wear do come from the flea market). beiges and blues – love the combination! I adore this outfit! That trench and scarf look so beautiful! I love everything about this one. Well done. It's a close 2nd to my fave of all time…that long haired red head lady on a bicycle in NY's Meatpacking (not sure abt the neighborhood…) ..I think it was included in your book. Looks like the Italian version of a biker chick requires high heels. This is art! You are a true artist, Mr. Schumann. I know she<s looking at an electronic device, but I love the mood of this shot. You keep on growing as an artist, Sart, in my humble opinion. What a lovely Vespa. I love the way its another accessory to her outfit. This photo is perfection. 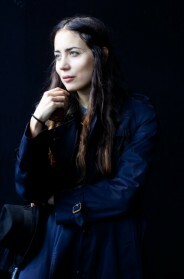 I love her style…amazing pic. Fabulous dress! Love the x-ray print and the colours. Style is when the clothes are incidental to the life, when the clothes say, " Oh, this? Yes, I like it, but I have some place I'm off to…"
wow! so great she just look perfect like all. I just love ur Blog!=)! I can't help it, but I think riding a Vespa is extremely stylish. Lovely picture, especially the reflection. And furthermore, her whole outfit ! Kind of harmony….and I like her shoes either! …and I like her shoes either! She's amazing…looks like it could be a Vespa Ad. It's all about camel and blue this year. I love the shot, especially the vespa! Sigh. How do you tie a scarf like that? I adore Vespas but still get nervous when I have to get on my friend's scooters. I don't think I will be buying one anytime soon. I'm too scared to drive in Rome. 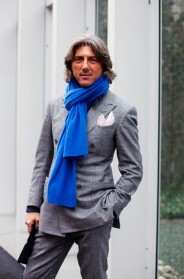 i love the scarf in blue and always love italy style!! Great photo! I love how real it is and the vespa of course. yes yes yes, you are the best!! love your blog! Vespa forever. Scott you're blue!!! j'adore! especially love the headband! LOVE how her Vespa complements her outfit perfectly. Beige and sky blue is the best combo!! What can I say, I just love this picture. A classy lady, with that up to the minute, city girl edge. I want that bike!!! so chic. i would love to ride a vespa around looking as beautiful as she does. sign me up. Whitout any pleasure I have to agree with the comment of "carola"
I love that she doesn't compromise style simply because she is riding on a Vespa. The color coordination between the dress and scooter is lovely as well. A mermaid with stilettos. On a matching Vespa. I'm deeply affected. I love this photo ! Unusual ! Yes, yes, yes. She's everything I imagine Milan is and should be. I love her unaltered nose best and then the way she classes-up a 'do rag. Not feeling her style, but I'M LOVING THAT PHOTO. Great composition, as always. Ahhhhh, scooters! This is probably one of the images every woman has in her head when she thinks of herself on a Vespa. I would do alot for those shoes no doubt. Sart, this is my second all time fave, beside the girl with the black t shirt tucked into a blues strapless dress. Truly, as another poster commented you've really found your voice with the camera. Well done. i love the helmut lang bird print dress and matching vespa! Wow, this is so chic!! This is fantastic. A piece of art. LOVELY!! i love her head scarf and the blue&white mix. Just beautiful. She looks fab – so stylish. I am always envious of women who can work the headscarf: I put them on and then immediately take them off. I'm just too self-conscious to carry this look off. It's really cool to see women riding on a Vespa.This photo has a very good angle. Absolutely gorgeous, love the leggings and the teal/camel combo. Effortless style.